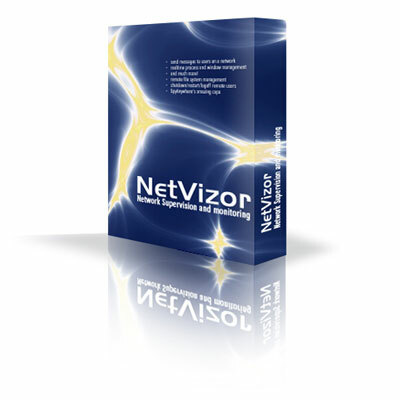 NetVizor is the latest in award-winning employee monitoring software. Monitoring your entire network from one centralized location couldn't be easier! 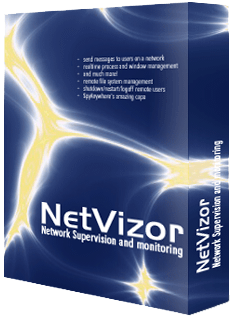 NetVizor employee internet monitoring software allows you to track workstations and individual users that may use multiple PC's on a network. NetVizor allows you to perform employee monitoring, content filtering, internet website monitoring, remote administration, and more - from one centralized location on the network. Combining real-time remote surveillance with individual user monitoring and security auditing, NetVizor is the most comprehensive employee monitoring and internet abuse control solution available! Track and Monitor Roving Employees - NetVizor allows you to track roving employees and network workstations on your network from one central location. You can directly connect to remote computers via the configurable NetVizor viewer, or you can monitor logs for any individual employee on your network. View and Monitor on Employees in Real Time - Monitor workstation and employee activities in real-time. Remotely Control Employees and Workstations - Remotely browse employee file systems, perform employee security audits, manage employee windows and processes, and much more. Employee Monitoring From a CENTRAL LOCATION! - Monitoring your entire corporate network from one centralized location could never be easier! Web-Based Realtime Monitoring and Remote Administration - NetVizor network monitoring software allows you to connect to remote workstations via your browser in realtime - allowing you to manage and track user activities from anywhere on the network. Our employee monitoring software can quickly detect and give you the evidence you need to prove that your employees are abusing business work time. Our spy software tools, such as SpyAgent and NetVizor, can operate in total stealth - defeating the built in Windows task manager and popular spyware detection tools. These abilities mean you will not have to worry about your employees discovering you are monitoring them - and even if you inform them they will still not be able to tell how. Logs can even be stored in an encrypted format, so they can only be viewed with our software. Our employee monitoring software will log and record what your employees type, who they talk to, documents they open and print, what websites they visit, software titles they run, emails they send and receive, and even screenshots of their actual online activities. Our employee monitoring software also features built in content filtering tools to restrict your employees from visiting inappropriate websites, running restricted software, or chatting online. Email alerts can be sent when an employee attempts to abuse any of the restricted settings our software enforces. All logs can be viewed remotely from a central location as well - no need to physically visit each worker's computer. Keep your employees on task and save money otherwise wasted by inefficient workers. Employee Internet Abuse Diminishes Productivity! The Internet has proven itself to be an addictive distraction for employees. If you suspect your company's productivity is suffering because of wasteful employee Internet use, then keep reading. While many employees choose to use the Internet for work-related purposes only, others decide to abuse the luxury of having Internet access at their workstation. Of the top six reasons why employees waste time at work, being underpaid ranked dead last at 18%. 35% of employees said they waste time at work because they're not challenged enough. That was followed closely by the 34% of employees who claimed they waste time because their hours are too long, 32% whose company gives them no incentive to work harder, and 30% who are unsatisfied. Additionally, 23% of respondents said they waste time at work simply because they're bored. Over 64% of respondents admitted to wasting time at work. This is down nearly 10% from Salary.com's 2008 survey. Of those surveyed, 39% spend a mere 1 hour a week on non-work related items. That's followed by 29% who spend up to 2 hours a week wasting time on the computer at work, and 21% who waste up to 5 hours a week. Only 3% of respondents spend 10 hours or more on personal tasks while at work in a given week. When asked what websites they visit if they do stray from work-related tasks. Most people spend time checking their personal email, visiting news sites, performing Google searches, monitoring social media and shopping online. Facebook topped the list. The social media behemoth with nearly 850 million users worldwide is visited by 41% of our respondents. That's followed closely by LinkedIn at 37%, Yahoo at 31%, Google+ at 28% and Amazon.com with 25%. This employee internet abuse could cost your company thousands of lost work hours and productivity. When you "trust" an employee to only do actual work on their workstation, you open yourself up for a great loss, especially in Call Centers , Data Entry Centers and other open-space offices. Imagine an employee left alone in their office or cubicle. What do they do once you are gone? Do they perform work like they are supposed to? Or do they play games and perform other NON-WORK related tasks? Do you know what they are doing online all day? Want to learn exactly how much this wasted time is costing your business? See our Cost Benefit Calculator! Act now and monitor every employee in your office! NetVizor is THE Solution for Employee Monitoring! With NetVizor, we have your entire network covered. Whether you have just 5 PC to monitor or 25,000, NetVizor was developed with your network in mind. Have a question? We'd love to help you, just submit a quick support ticket or look through our NetVizor Help Section. Trying to figure out how much money is being wasted by your employee's bad habits? Take a look at our Cost Benefit Calculator! Interested in testing NetVizor on your network? Please be our guest! Our demo is fully featured but time restricted. The 30 minute time limit should provide enough time for testing, however, if you need more time, just send us a quick email for instructions. NetVizor uses minimal processing cycles. It remains invisible and secure on your network. Built to be fully scalable with your business is mind, no matter the size. Supports Windows NT, 200x, XP, Vista, 7, 8, 8.1 and 10. Supports both 32-bit and 64-bit Operating Systems. A minimal 3 MB hard disk space. UPDATE: Now with full Windows 10 and Microsoft Edge Browser compatibility! NetVizor now allows total remote take-over and controls! See our latest news & updates for more. © 2005-2019 NetVizor. All Rights Reserved.